We are so proud of all of you who completed our TransFive Challenge! Thank you for committing to five days of no sugar and giving it your all! Let's start this week STRONG! Love your body today and take time to make a plan for your exercise and nutrition. Today, we want to share a client spotlight that will encourage you on your transformation journey! I met sweet Kathy Cousart, years ago when I was a GymDog and she was the Assistant Golf Coach at Georgia. We did aerobics together in the old PE building on campus! Little did I know, 20 years later our paths would cross again! God is so confirming and so good! I love how He brings us all full-circle and connects us with special people who touch our lives deeply along the way! Each person that crosses your path today could be someone who inspires you and could possibly change your life- you never know what God has in store- but we can be sure His plan is so much greater than we can imagine! Kathy's story is so inspiring because no matter where you are on your health journey YOU CAN begin again and reach your goals. She was was 5th in our Holiday Extravaganza Contest (love it..still a competitor...always ALL IN) and just told me about her new goals for 2018! Dream it, believe it, achieve it! Kathy, thank you for sharing your story with us and for living transformed by doing everything with your whole heart! I am so proud and happy to be a part of the community at Transfit. So very special to have finished in the top 5 of my first Transfit Challenge and appreciate the many connections to finding my way to work out there! 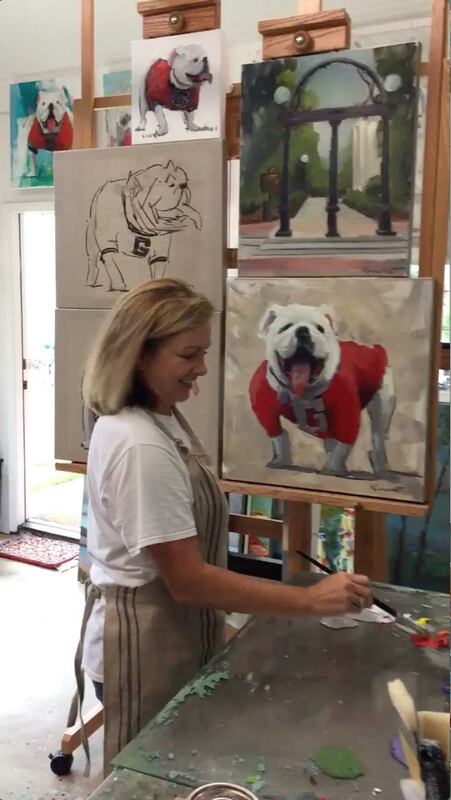 My admiration and appreciation for Caroline goes back a long way to UGA Athletics. I was actually coaching Women’s Golf at the same time that Caroline was competing in Gymnastics. My Golf Team did aerobics and worked out with the Gymnastics Team and it was always a fun supportive environment all the way around. Loved it! Fast forward with all the fabulous twists and turns of life and I am now a full-time successful Artist painting almost every day out of my Carriage House Studio right here in 5 Points. I had continued working out and being active over the years but had some issues with my torn Rotator Cuff. I need that arm and shoulder to paint daily so felt I sometimes had to make a choice and painting always won out. I needed a safe way to work out and get back to being strong and lose that bit of weight that has slowly crept on. I have been in that “sandwich” place for quite a few years with finishing raising up my daughters and getting them through with college and starting careers while also caring for my Mom and Mom in Law. It gets tough being a full-time caretaker and 11 years really took its toll on me….everyone and everything came first and I just was too tired and worn out to make myself any kind of a priority. I was busy beyond busy with being a full-time caretaker, my art career taking off and beautiful grandchildren beginning to make an appearance. Blessings like I have never known along with some “hards.” Life. I believe that my art and painting came to me at just that right time. I was watching my Ph.D. Mom- the smartest woman I have ever known - struggle through a battle with Severe Vascular Dementia. I found that my art and painting was such a gift and place of peace to go to escape that sadness. As my Mom needed full-time care, it was important to me to be there while she still “knew” me and care for her. I learned the most important lessons I think I will ever learn about myself during that time and was such a gift. She remains the kindest person I have ever known and I try so hard to be that kind every single day. Over a year ago….Within a 9 month span….I wound up losing not only my Mom and my younger brother 6 weeks later but two other family members and finally my big sister best friend Meg. It was a huge wake-up call to taking care of yourself and being strong enough to fight whatever fight comes your way. With all of that in mind and circling back….I had heard amazing things from several friends about Transfit and started going. As with almost everyone there…..that last few minutes of stretching out and taking a moment to appreciate that we are here and embracing this day gets me every time. I can’t say enough about how knowledgeable Caroline is. I have always been pretty lucky and able to eat anything I wanted with my level of activity and good genes. I finally understood to watch carbs at my age—-I can’t quite process them like I used to could. I learned to eat a healthy snack when hungry and to make better choices. I learned to LOVE water….what a difference when you listen to your body and really re-fuel it with healthier options. I have changed so much with being at Transfit…it’s a positive and uplifting environment with gals of all ages encouraging each other along this journey. My tastes have completely changed and it’s a lifestyle now——with healthy options to satisfy that sweet tooth. I want to know that I am doing all I can to take better care of myself and able to be all that my grandbabies want me to be. I want to be strong for whatever comes my way. I want to be strong to be able to carry around my grandchildren who trust I will catch or carry them at their whim. I want to feel as good as I do working out at Transfit and being surrounded by everyone else there working on their own journey. It’s an amazing place and always a supportive environment. I have loved reading everyone else stories and am inspired by every single person there each day. I have always believed that anyone can do anything they set their mind to….if they want it bad enough and work hard enough. If I can do this….so can you! Kathy, we are so proud of you! Ladies, may we all feel inspired by Kathy's story! Let's make this week count! Keep pushing yourself to get active every day this month! Send us your February calendar challenges at the end of the month! We are also offering two NEW session times! Starting tonight, we will now have a 7:15 PM session and we will offer a Saturday at 10 AM session starting February 24! Come join us! Sign up on the app HERE! Also, don't forget you can always find FREE recipes, workouts, inspiration, and videos on our website and app!